I am sure everyone has their own way of making this breakfast. However, I have decided to share my recipe for scrambled eggs regardless. Did I miss something in the original request, or the second one, or even the third one? Everyone in business is in it to make money! People do not run companies to give away product unless it is about sponsorship. Now, I am more than willing to sponsor a function or event, and I have done so on a few occasions, but the original request has come as sponsorship and not as a query to whether I can supply x. With the saying time is money, this was a waste of time and while I was attempting to get this business, I could have been out there getting other business. So, this was a waste of money! I hope this agency realized that they are getting paid to ask for something for nothing. If you are looking to save some time with breakfast, make these scrambled eggs. They will be ready quicker than you think and take very little effort to make. I’ve just had scrambled eggs for lunch! 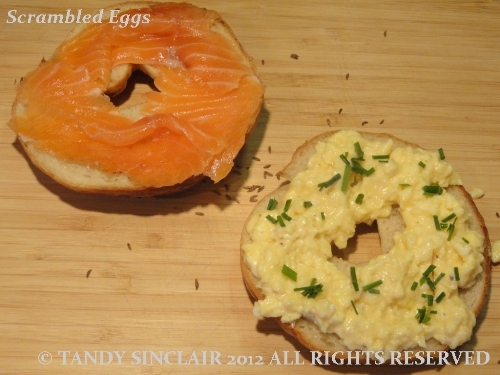 They go so well with smoked salmon – I’ll have to get some to go with them next time. Your scrambled eggs look like a real treat! We had a tasty omelet with herbs, mushrooms, chives & sjalots yesterday evening! Love the addition of cream! Scrambled eggs – done well they are wonderful, done badñy…well, so awful! And I know what you mean about clients. Sometimes when I was doing my HR consulting a potential client would meet with you to discuss how you could work together and you could see they were just picking your brains for a free solution! Oh I hear you gals!I have some “potential clients” who call quite regularly for a pep chat and industry wrap and before I know it another half hour is gone. Amazing how some people seem to think it’s quite acceptable to run their business at the expense of yours! These eggs look so buttery and delicious – yum! Love scrambles – we probably have them for breakies more often than we should though. how very odd. maybe the agency decided to change the words of the client? I have no idea Sidey! ?